I grew up on mac n cheese and so have my kids–until we began examining everything in our diets. Sadly for my kids Kraft Mac n Cheese was the first item to toss because of dyes and carcinogens. And here is the kicker, its been banned in Europe for years. So I opt to purchase organic and all natural mac n cheese or make it myself. Here is a recipe my kids love. Pour the 5 tablespoons of olive oil into a heavy bottomed sauce pan and add the flour. Cook the flour in the oil for five minutes over medium heat. In another sauce pan, heat the Almond Milk to a simmer. Slowly whisk Almind Milk into the cooked flour mixture, constantly stirring. Add sea salt and pepper & remove the pan from the heat. Begin adding 1/4 cup amounts of the grated cheeses while continuing to whisk. Once the cheeses have melted and the sauce is smooth, set the pan aside. In a food processor, pulse the bread till it resembles fine bread crumbs. Add the olive oil and pulse again to distribute evenly throughout the bread crumbs. Slice 2 medium sized tomatoes into thin rounds. Once the water has come to a full boil, add the salt, olive oil and pasta.. Remember that pasta continues to cook AFTER you have drained it, so keep that in mind when testing for doneness... undercooked slightly is okay since this will be baked as a casserole. Drain the pasta and pour into dish lightely coated baking dish with olive oil, add the cheese sauce and gently fold to coat it. 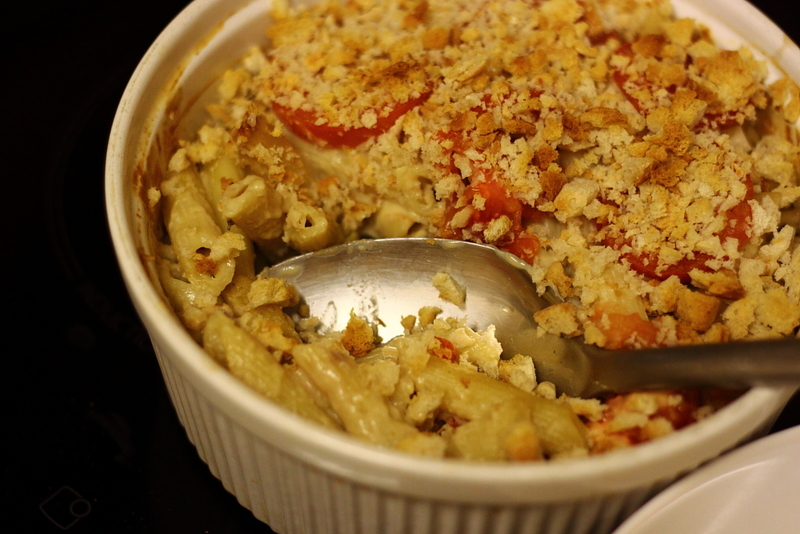 Top the pasta with the au gratin bread topping and arrange the tomatoes over the top. Spray or brush the tomatoes with olive oil and at 375 degrees for 15 minutes. Before serving, broil the top under the broiler on a low shelf to prevent burning. Once the top is golden brown, remove and serve. Should you have any leftovers of the Vegan Macaroni & Cheese, let it cool completely or even better refrigerate the leftovers. Then when completely cold, cut into serving sizes and wrap in plastic wrap. Either refrigerate or freeze the portions for reheating later.